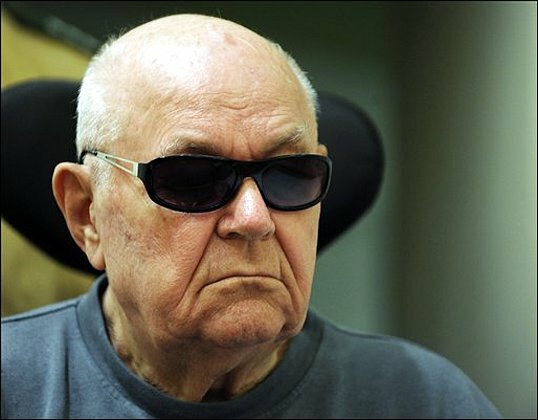 MUNICH, Germany -- John Demjanjuk accused a German court where he is being tried on charges he was Nazi death camp guard of ignoring evidence Tuesday after the panel of judges hearing his case rejected a raft of defense motions. Accused Nazi death camp guard John Demjanjuk. In a rare statement to the court, Demjanjuk accused the judges of bias after they ruled that defense requests for investigative files from Russia, Ukraine and elsewhere were too general to be acted upon. They also denied a defense request that the two prison doctors who see Demjanjuk regularly be brought in as witnesses to testify on the 90-year-old's frail health. The Ukrainian-born retired Ohio auto worker is standing trial on 28,060 counts of accessory to murder for allegedly having been a guard at the Sobibor death camp in Poland. Demjanjuk denies ever being a camp guard, saying he has been mistaken for someone else. "The judges suppress the Israeli, American, Polish, Russian and Ukrainian files about me, fearing that there is more evidence of my innocence..." he said in the written statement, which was typed in Ukrainian and read aloud in German by a courtroom translator. "This is all evidence of the fact that the trial in Munich against me is illegal and wrong." He asked that the statement be provided to "authorities" so that the accusations could be investigated. Demjanjuk confirmed that the statement was his own when asked by Presiding Judge Ralph Alt, but then defense attorney Ulrich Busch said he would not answer any further questions. The statement came after the court rejected a total of 23 defense motions. Among them, Busch has been denied the chance to question to two of Demjanjuk's doctors about whether their assessment of Demjanjuk's health is different than that of court doctor Albrecht Stein, who has consistently maintained that Demjanjuk remains fit for trial. Busch and Demjanjuk's family have argued, however, that his health has been deteriorating and his pain is now so great that he can no longer concentrate on the proceedings. Alt said that the judges had ruled that Stein was the doctor chosen by the court to give his assessment of the overall situation, while the other doctors responsible for his day-to-day care had a more narrow picture of his health. Following the ruling, Demjanjuk's son, John Demjanjuk Jr., accused the court of ignoring medical evidence to go ahead with the trial at any costs. "While they silence the prison doctors and deny us the weekly clinical reports - against all western legal and humanitarian standards - they rely on a court appointed medical stooge whose therapy is to shoot my father with various drugs and call him fit," said John Demjanjuk Jr. in an e-mail to The Associated Press.